It's been a while since we featured any food related content on the creative pie, but this is sure to get your mouth watering. 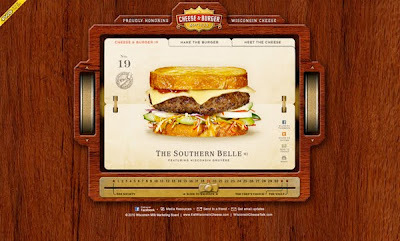 Fantastic photography, great navigation and brilliant voiceovers make The Cheese And Burger Society website a winner. The site champions the key ingredient of all good burgers, cheese. In their own words the Cheese & Burger Society firmly believe that cheese is the Grand Pooh-Bah of every cheeseburger ever grilled at a backyard barbecue or served at a roadside diner. Not just any slice of cheese, but the one and only Wisconsin Cheese. Have fun choosing your favourite burger, ours is Number 24, The Brooklyn. Rest in peace hunger, rest in peace!